You can view the list of participants in your course in the Course Roster. Quick Tip: Students are automatically enrolled into courses 14 days prior to the first day of the semester. If the roster is incorrect, please contact the Faculty Technology Center. 1. Find the LSU People block, located in the lower left of your Moodle course front page. 2. Click on the Course Roster link at the bottom left of the block. 3. The Course Roster page will show you the names of your students and other participants. You will also see their photo ID images. Students do not see the photo IDs of other students. 5. If you have multiple sections in a class, you can view each section as a separate group by selecting it in the Separate Groups dropdown menu. 6. 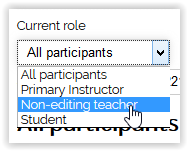 If you want to view participants separated out by role (such as TA or Non-Primary instructor) you can select a role by using the Current Role pull-down menu.